What you're looking at isn't just the ugliest front-wheel-drive car ever, it's the ugliest and the fastest FWD car ever. Renault wants to make sure its customers know this, so they etched the R26.R's 8m 17s Nurburgring lap record for production FWD cars into the rear windows. Find out what makes the .R so special after the jump. Using the Mégane Renaultsport 230 F1 Team R26 as a basis, the .R uses a carbon-fiber hood, polycarbonate windows and a titanium exhaust, and drops all the interior bits including the rear seats, the climate control, every airbag except the driver's and the sound deadening. The changes all add up to a significant 271 lbs. The .R also uses stiffer suspension with custom geometry, track tires and upgraded brakes. The package results in a 0-60 time of 6.0 seconds, and that all important lap record, probably making this the best driving FWD car of all time. Full specs below. 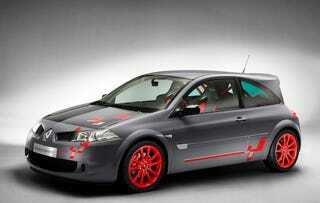 The Mégane Renaultsport 230 F1 Team R26 was launched in November 2006 and has enjoyed a great success. Using this base, Renaultsport launch an extreme version, the Mégane Renaultsport R26.R. Developed by Renault Sport Technologies, the Mégane R26.R joins the family that also comprises the Clio Renaultsport 197, Mégane Renaultsport 225, Mégane Renaultsport dCi 175 and, from September, the Twingo Renaultsport 133. Since the launch in April 2004, the family of Mégane Renaultsport has sold more than 20,000 units in almost 30 countries. The launch of this ultimate version underlines Renault Sport Technologies' role as a leading manufacturer of high performance cars. Renault Sport Technologies have given the Mégane R26.R visual differences that mark out the car at first glance. The carbon fibre bonnet and new 18" alloy wheels in red are the main visual clues together with a new rear spoiler, plus R26.R decals and logos and tinted polycarbonate in place of glass in the tailgate and rear side windows. The car is available in seven colours, two of which are new to the Mégane, Racing Blue and Renault i.d. Lunar Grey and one is brand new, Renault i.d. Pearlescent White. To guarantee the best possible traction, the R26.R retains the limited slip differential from the Mégane Renaultsport 230 F1 Team R26. This is a mechanical differential with helical teeth and retains the same transfer rate of 33%. The combination of this limited slip differential and independent steering-axis front suspension minimises torque steer and enables power to be applied earlier during cornering. A performance car needs brakes that are both powerful and fade-resistant. The Mégane R26.R has large 312mm ventilated discs at the front with Brembo four-piston callipers that provide stopping power at the highest level. To resist fade, the discs are grooved as opposed to drilled. The R26.R takes its engine and gearbox from the Mégane Renaultsport 230 F1 Team R26. This develops a peak power of 230hp and torque of 310Nm. A characteristic of this engine is the wide power band, with 90% of the torque available from 2000 to 6000rpm. However, to reduce the gear change time, a short-shift gear linkage is fitted. The R26.R accelerates from zero to 62mph in 6 seconds and passes the 1000 metre mark in 25.9 seconds. The combined fuel consumption is 33.2 mpg and emissions are 199g/km. On 23 June, the Mégane R26.R established a new lap record for a front wheel drive production car of the Nürburgring circuit with a time of just 8 minutes 17 seconds. To commemorate this exceptional level of performance, the circuit outline and lap time is etched into the rear side windows. The Mégane R26.R is unveiled today, 22 July, in London at the British International Motor Show and goes on sale in October limited to just 450 examples in total.